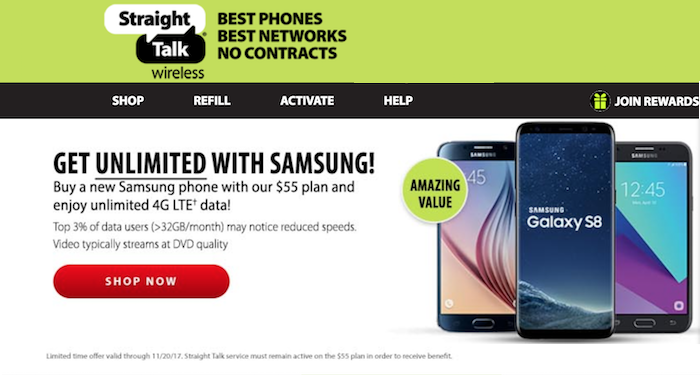 Straight Talk has taken their first step towards offering an unlimited data plan. When you buy a Samsung phone and sign up for their $55 plan you’ll receive unlimited talk and text and unlimited 4G LTE data. Now this a limited time offer valid thru Nov 20 2017 and Straight Talk service must remain active on the $55 plan to receive the unlimited data benefit. As with any unlimited data plan there are a few things you need to be aware of. First, the top 3% of data users( >32GB/month) may notice reduced speeds. So if you are in the top 3% or data users, you may see a reduction in data speed. Now they don’t say if your speeds are reduced to slow 2G speeds like Straight Talk’s other plans or if they will simply de-prioritize heavy data users if needed. This means you’d still get fast data as long the network isn’t congested with other users. Next, video streams at typically DVD quality. This means if you are watching HD video, the network will automatically reduce the quality of that video to SD quality which is much lower. High Definiton (HD) video is often referred to a 1080p while Standard Definition (SD) video is 480p. It’s like the difference between watching a DVD vs a Blu Ray disc or streaming HD video from Netflix or another service. Some wireless companies claim they reduce the quality to optimize it for display on mobile devices but really they do it to save data on their networks. Neither of these points is a dealbreaker. You just need to be aware of it and decide if they are an issue for you. If you look on straighttalk.com, you’ll see they offer a number of different Samsung Galaxy model phones ranging from entry level models to older and the latest model Galaxy S phones including the Galaxy S8+ and Note 8. You can pick the phone that is right for you. You may want to contact their support department to check to see whether the phone will use the AT&T, Verizon, T-Mobile, or Sprint towers in your area. Use the Live Chat feature. Tell the support representive your Zip Code and which phone you are interested in and ask which towers will use in your area. Make sure the phone you are interested in uses one of the networks that works well in your area. Now is this a good deal? $55 for an unlimited data plan is a pretty good price. Normally Straight Talk’s $55 plan comes with 12 GB of high speed data (and apparently recently updated to 15GB) of data. It’s unfortunate you cannot get the unlimited data with one of Straight Talk’s iPhone models nor if you a Bring Your Own Phone (BYOP) customer. And this is a limited time offer, so after Nov 20, I’m not sure if and when they will offer it again.